Battle Ground is a city of over 18,000 residents in southern Washington state, just north of Vancouver and the border with Oregon. The city is in Clark County and is part of the Portland-Vancouver-Hillsboro metro area. 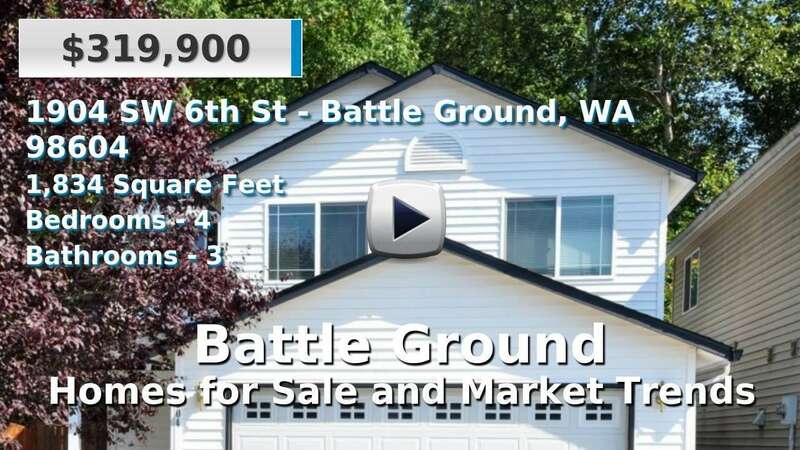 This city is growing fast; homes for sale in Battle Ground range from renovated to custom, and are typically newer than the state average. The convenience to both Vancouver and Portland make it a popular choice of suburbs. The average commute here is about 30 minutes. Surrounding communities include Lewisville, Venersborg, Hockinson, and Brush Prairie. 4 Beds | 3 Baths | 2551 sq. Ft.
4 Beds | 2.5 Baths | 2193 sq. Ft.
2 Beds | 1 Baths | 728 sq. Ft.
3 Beds | 1.5 Baths | 1598 sq. Ft.
4 Beds | 2.5 Baths | 2106 sq. Ft.
5 Beds | 2.5 Baths | 3130 sq. Ft.
3 Beds | 2 Baths | 1835 sq. Ft.
3 Beds | 2.5 Baths | 1514 sq. Ft.
2 Beds | 1 Baths | 931 sq. Ft.
4 Beds | 2 Baths | 3308 sq. Ft.
4 Beds | 3.25 Baths | 3402 sq. Ft.
4 Beds | 3.5 Baths | 4955 sq. Ft.